During the 1960s, the phrase “military intelligence” was considered an oxymoron. In the midst of the Vietnam war it was a darkly glib joke, defensible only because of the series of strategic blunders that were made; it certainly seemed to be true that military officers were not the brightest candles in the chandelier and disdained expressions of intellect. “Yet for all his asceticism, McChrystal displays a subtlety that suggests a wider view of the world. ‘If you go into his house, he has this unreal library,’ Maj. Gen. Michael Flynn, McChrystal’s intelligence chief and long time friend, told me this summer. ‘You can go over and touch a binding and ask him, ‘what’s that one about?’ And he’ll just start. His bad habit is wandering around old bookstores. He’s not one of these guys that just reads military books. He reads about weird things, too. He’s reading a book about Shakespeare right now.’” [our emphasis]. There you have it: A four-star general who enjoys exploring old book shops, has a vast library of well-read books, can discuss them intelligently and in depth, and reads Shakespeare. And another general who seems to think that reading books about anything other than the military is weird. Gen. McChrystal, apparently, loves Caliban, hates the Taliban, and is comfy with The Tempest and in a tempest. 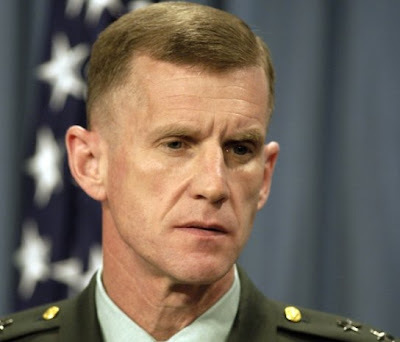 According to the Joint Chiefs of Staff official bio of McChrystal, the general, who earned a BS at West Point, also has a MA in National Security and Strategic Studies, and a MS in International Relations. The Army really does want their troops to be all that they can be; commissioned officers are encouraged to earn graduate degrees, as many as they desire and to whatever level they aspire to. U.S. military officers can pursue full-time studies toward a master’s or doctoral degree through either fully funded or partially funded programs or a bachelor’s degree through the Degree Completion Program. Under these programs, the Army pays all tuition costs and reimburses officers up to $600 per fiscal year for textbooks and supplies. In addition, the Army provides officers with full pay and allowances and moves officers and their families to the college or university of study. Whatever your feelings are toward the military in general and our involvement in Afghanistan in particular, it is reassuring to know that our man in charge of operations is not a numb skull. Warrior-scholar may not be a hyphenate appreciated by a general public that prefers its military to be all-fight, all-tough, all the time, no pointy-heads, please, but the U.S. military has no problem with it at all. They understand that a broad and deep perspective of the world is crucial to comprehending and coping with the challenges we face. Higher education, a love of books, and reading can only benefit its officer corps. There will always be military officers (and business executives) with a maraca where their head is supposed to be; shake 'em and you can hear beans bouncing around inside. That is not the case with Gen. Stanley McChrystal. "...for the play, I remember...'twas caviar to the general" (Hamlet, Act 2, scene 2). One Hell of a Book Store - Or the Wrong One?